Memory Foam Mattress Reviews - What is the Best Memory Foam Mattress? Reliable Memory Foam mattress reviews can be difficult to come across, so in this article we've broken down all the essential information you should know about this type of mattress if you're considering a purchase. In this memory foam mattress review we'll cover the material itself as well as the range of memory foam products offered including pricing and guarantees, as well as providing some general information with regards to consumer satisfaction when using these products. First of all, let's discuss what memory foam really is and why its different from other materials. 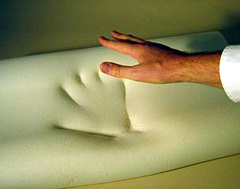 Memory foam is a type of polyurethane which has properties which allow it to mould its shape to the human form. Hence the name, as when you get up, you can still see the impression of your body  the foam "remembers" your shape. Immediately, you can see the angle of this product  the idea that the foam moulds itself specifically to your shape implies you should sleep better on it, because it's a fully customized sleeping experience. Memory foam was in fact developed for NASA in the 1960s, but it wasn't until the early 1990s that its uses for bed mattresses became apparent. There are a variety of brands selling memory foam mattresses, and there is a wide range in quality from the best to the worst. Some mattresses marketed as memory foam are actually made of similar but inferior materials that appear to be memory foam when you make the purchase, but do little to actually help you sleep! As with any major purchase, always be careful that what youre buying is the real thing. One of the more well-known brands of memory foam mattress that youll come across in many memory foam mattress reviews is the Tempur-Pedic mattress. Other popular brands include Bodi-Pedic, Aerus and Novaform. Tempur-Pedic is known to be more expensive than many other brands, but it also rates comparatively well in terms of customer satisfaction and the lifetime of the mattress. Tempur-Pedic offers three distinct varieties of mattresses: the original memory foam, a higher density version of the foam called Tempur-HD, and a third version called Tempur-Cloud. The Tempur-HD material is designed for those who prefer a firmer surface, although it conforms to your body shape in the same way as classic memory foam. The Temper-Cloud variety is a combination of support and softness by combining memory foam will a pillow-top mattress. There are different styles of bed made from each material to cater to the individual needs of different sleepers. Its possible to get memory foam mattresses in virtually any size you could want. Manufacturers make memory mattresses in California king size, king size, queen size, twin size, doubles, crib size and camping mattresses. Memory foam pillows are also available. Not all memory foam mattress reviews go into detail about size, so lets break down what each of these sizes entails to help you decide which is best for you. A California king size memory foam mattress - 72 inches by 84 inches, although this can also differ depending on manufacturer. Aside from these sizes, many memory foam mattress companies also offer custom sizes so you can order a bed to fit your needs. As mentioned above, the depth of a mattress will differ depending on the style and the manufacturer. A fairly standard depth for a memory foam mattress is around 8 to 10 inches deep, although you can find mattresses up to 16 or 17 inches deep. This is particularly true with softer versions such as the Tempur-Clouds range. Due to the range of quality and the added value of established brand names in the industry, there is a great variety in the pricing of memory foam mattresses. Tempur-Pedic, as mentioned above, is known to be pricier than many other brands, but many customers are willing to accept that extra cost to buy from a trusted name. The cheapest memory foam mattresses you can expect to come across will be around $150 US. Even at that price, you should be wary of quality  anything below that and youre in serious danger of buying something that isnt real memory foam. A basic queen-size memory foam mattress can be had for around $300-350 US, but to ensure youre getting a decent quality mattress you are best to start looking around the $700 mark. However, if you're on a strict budget, you may want to check out this list of best mattresses under $500. A top of the range California king from Tempur-Pedic can cost around $3200 or up to $3800, depending where you buy from. However, a few words of warning need to be said with regards to the price range of mattresses. Some memory foam mattress reviews neglect to mention the price range, or why theres such a wide gap. While some mattresses are may be priced highly due to brand name rather than actual quality, you do have to keep in mind that extremely cheap mattresses are extremely cheap for a reason. Typically it's because they are made at low cost, meaning they are probably made from materials similar to memory foam but of low quality, offering no real sleeping benefits, low durability and a short longevity. As mentioned above, Tempur-Pedic is widely recognized as being a top brand in the memory foam mattress world. Although Tempur-Pedic beds are more expensive than many other brands, they ensure top quality, offer a 90-night trial with all beds and also provide a 20-year guarantee. Our memory foam mattress review would be incomplete without a look at customer satisfaction. One of the reasons Tempur-Pedic is such a popular brand is their high consumer satisfaction rating  some surveys have even indicated the percentages of Tempur-Pedic customers who are satisfied with their purchase is around 80%. Points that owners of this of mattress often note in reviewing memory foam mattresses include the absence of springs and the way the mattress reacts to your own body heat and pressure. The most often cited con of high-quality mattresses is the high price, although many consumers note that it is worth the money for the quality of sleep and relaxation provided. It's worth noting that some owners of memory foam mattresses have reported that they've developed health issues after sleeping on the memory foam. These health issues sometimes include migraine headaches, scratchy or sore throat, and even difficulty breathing. Be sure to read about how memory foam can potentially harm your health before you buy a memory foam mattress. Do you have a memory foam mattress? How do you like it? Would you recommend it to others?